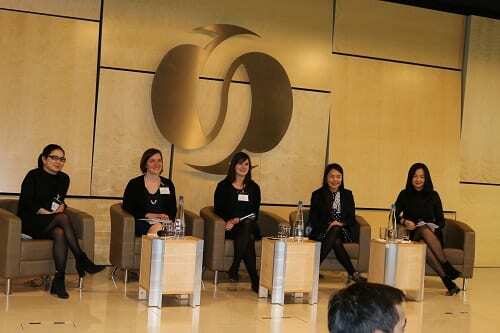 On Thursday, April 6, we (Rebekah Plueckhahn and Lauren Bonilla) participated in the 13th annual Mongolia Development Forum, held at the headquarters of the European Bank for Reconstruction and Development (EBRD) in London. 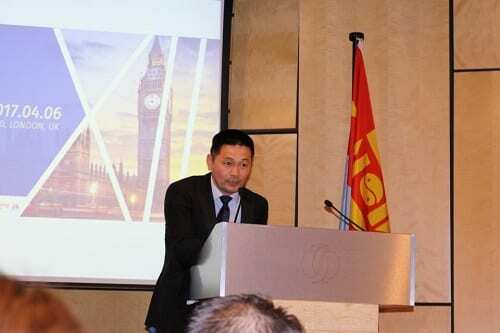 The forum was co-organized by the Ministry of Foreign Affairs, Mongolian Embassy in the UK, Mongolian Association in the UK, Tsahim Urtuu Holboo, Mongolian Business Database, and Council of Mongolians Abroad. The theme of the day was ‘Opportunities in Mongolia’, which addressed three key topics: Business in Mongolia, Challenges and Opportunities; Social and Legal Issues; and Mega-Projects. Bataa Tserenbat, the event organizer, introduces the mission and history of the Mongolian Development Forum to a packed auditorium. 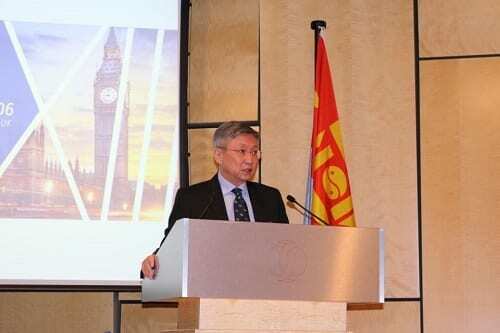 Bayar Sanjaa, the former Prime Minister of Mongolia and current Ambassador of Mongolia to the UK, gives a welcome address. 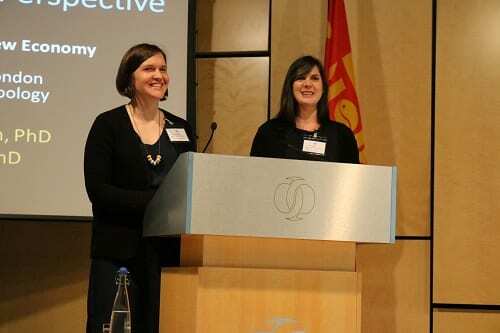 We jointly presented in the Mega-Projects session given our respective areas of research on the effects of economic fluctuations in Ulaanbaatar (Rebekah) and the mining industry (Lauren). Although these topics are quite different from each other in many respects, we have discovered in the course of our research that our findings yield many similarities. We have observed how urban development and the large-scale mine development could both be considered mega-projects in the sense that they promise to be transformational in nature. They also involve long time horizons in their development and require large amounts of capital investment. Moreover, while much attention is given to the role of more formal institutions, stakeholders, markets, and policies in influencing the development trajectories of largescale urban and mine projects, our research has shown that a diversity of actors, processes, and practices exist within, help to shape, and are produced from a mega-project. Lauren’s talk discussed a feature of the Tavan Tolgoi coal complex that has long been a source of debate and controversy: the multiplicity of companies that own and operate sections of the deposit located in Tsogttsetsii, Omnogobi province. In recent years there has been debate about consolidating the ownership of the Tavan Tolgoi deposit so that it is governed by one company instead of the current situation where there are three companies running mine projects in close proximity to each other: MMC/Energy Resources (a publically traded company listed on the Hong Kong stock-exchange), Erdenes Tavan Tolgoi (a state-owned company), and Tavan Tolgoi JSC (a company owned by both the local province and private shareholders). While this diversity of ownership has presented a number of governance challenges, Lauren talked about how it has also been a blessing to some degree in the current period of economic crisis. Since the mining companies are differentially exposed to coal markets and operate according to various financing streams and shareholder interests, they have pursued divergent forms of extractive activity in response to the slowdown of the coal economy. Locally, this has meant that once-booming Tsogttsetsii has avoided facing a singular bust at Tavan Tolgoi. Instead, small stores, taxi and trucking services, car repair shops, and trade activities, among other businesses, have been able to survive amid the slowdown, even though many have suffered from crushing indebtedness, bankruptcy and capital loss. Lauren thus stressed the importance of diversification within a mega-project as a means to reduce exposure to market fluctuations, especially in a volatile industry like mining. She also drew attention to how diverse economic activities always exist around mega-projects, often in unanticipated ways. She presented an example of a scene she witnessed in April 2016 where a herding household traveled over 100 kilometers to Tsogttsetsii from another district in order to recruit temporarily unemployed mine engineers and professionals from Energy Resources to comb their large herd of goats for cashmere. In addition to benefiting the herders, the work gave the mine workers something to do instead of sitting idly at home waiting for Energy Resources to resume its operations. Rebekah opened her presentation by encouraging the audience to think about Ulaanbaatar city as a type of ‘mega-project.’ While different to other types of mega-projects with a more singular aim, she took several key points that apply to mega-projects more generally and applied them to different aspects of Ulaanbaatar. She described this as a useful way to look at the types of transformative visions and diverse economies that the city gives rise to. The first point was how Ulaanbaatar at different planning stages, during socialism, and in the diverse postsocialist environment, has formed a political power center and a locus for economic activity. In the postsocialist environment, the Ulaanbaatar 2020 Master Plan and Development Approaches for 2030, like other plans for different mega-projects, presents visions for various types of transformations. Rebekah went on to discuss how urban development in Ulaanbaatar is extremely sensitive to wider economic fluctuations, where the city, like other mega-projects elsewhere, is always partially completed. She emphasized how re-/development projects have long consisted of numerous diverse economic connections. This has meant that the recent economic downturn has affected vast amounts of people throughout the city. In conclusion, Rebekah discussed the economies of land access and land use that shape Ulaanbaatar, especially in the ger areas surrounding the city core. She described these diverse economies as two-fold: the economy of land access, as well as the numerous small business and livelihood opportunities that living on land can afford. She emphasized how influential these urban residents are in shaping Ulaanbaatar as a city, and the importance of incorporating these existing diverse economies in future urban development plans. The Q&A at the end was very lively. Rebekah was asked about how traffic and air pollution can be mitigated in Ulaanbaatar, to which she emphasized the different plans and efforts currently being discussed by state agencies and development organizations in Ulaanbaatar. Lauren was asked about what Mongolia should do to quickly address the current economic crisis, to which she cautioned against anything that promises a fast fix and discussed how the Emerging Subjects project conceptualizes crisis as a space that can allow for the emergence of new possibilities. The ‘Mega-Projects’ panel. From left to right: L. Dulamzul, Rebekah Pleuckhahn, Lauren Bonilla, B. Maral, and A. Gantuya. Related to this latter point, audience members showed great appreciation for the all-female makeup of our panel. As one Mongolian from the Ministry of Finance mentioned during the reception, mega-projects are typically a highly masculine arena. Had the panel been organized five years ago during Mongolia’s so-called boomtime, it likely would have been formed by men in suits talking about statistics, investment opportunities, and big infrastructure projects. Instead, our panel was very much about new ways of looking at and doing things, from our talk on diverse economies to Maral Bayaraa’s presentation about the application of innovative remote sensing technologies and Gantuya Ariunsan’s analysis of strategies to interpret future coal market prices. If our panel is an example of an opening that Mongolia’s economic crisis affords, then there are indeed opportunities arising to be hopeful about. 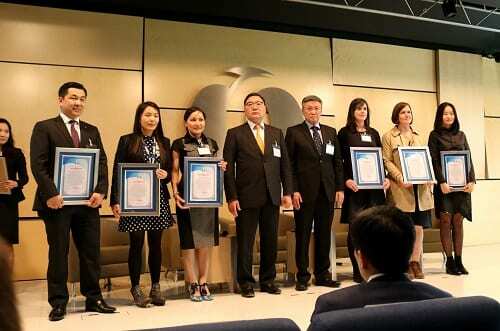 The Mongolian Ministry of Foreign Affairs presents awards to forum panelists. All photos © of Ganzorig Ulaankhuu. 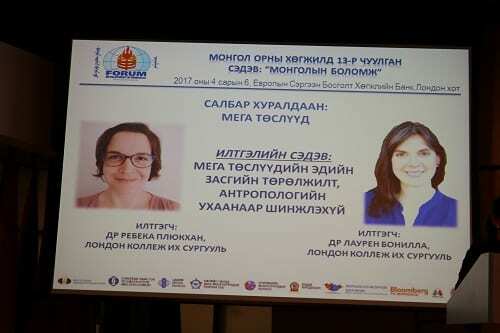 Acknowledgements: We thank Bataa Tserenbat for expertly organizing the event, Zula Luvsandorj for chairing our amazing all-women panel, and Ganzorig Ulaankhuu for taking photos at the event and sharing them with us. 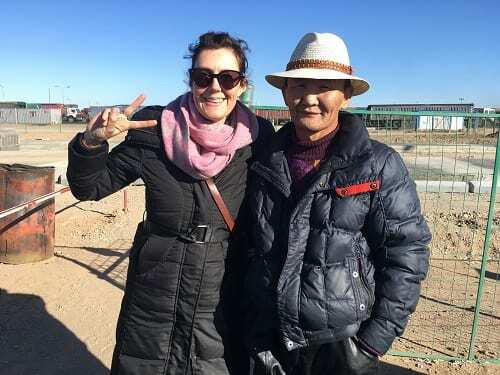 13 people from the Emerging Subjects team, from NUM and UCL, are currently on group fieldwork visiting the major mines and their communities in the South Gobi. We have visited Energy Resources’ coal mine Ukhaa Khudag in Tsogttsesii and the gold and copper mine of Oyu Tolgoi in Khan Bogd. We have also met with herders, such as Namsrai, and his family displaced by the mine, and a member of Khan Bogd’s citizens’ representative council, Batsengel. 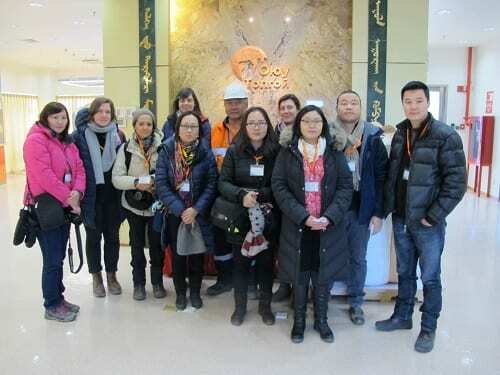 Research group at Oyu Tolgoi. Photo by Bum-ochir. Today we travelled to the border crossing between Mongolia and China, Gashuun Sukhait-Gants Mod, and met with the coal truck drivers (Nuursnii jolooch) who travel along this road, as well as the traders, border workers, money changers along this route, as well as meeting several hundred camels. 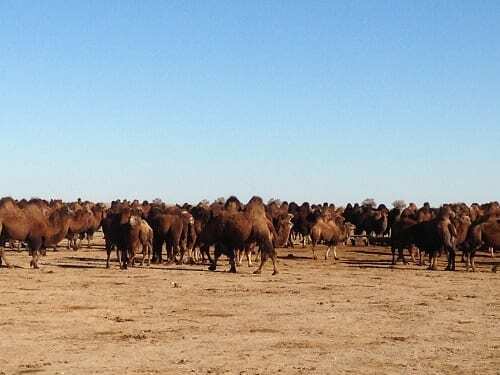 Camels drinking water at well. Photo by Bum-ochir Dulam. 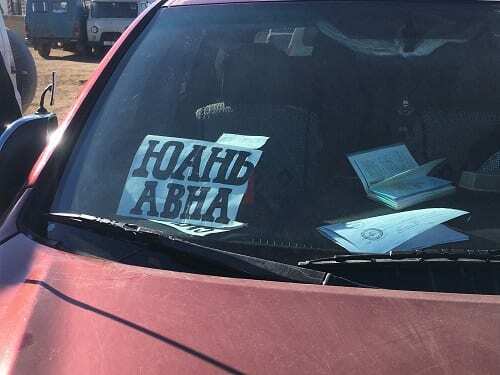 Here is a short video interview with Batbayar (from Hovsgul) from the inside of his truck as he drives toward the border. Batbayar explains the circular route of the truck drivers from the mines in Mongolia to the deposits in China, via the border crossing and along the coal road. The number of trucks on this road is approximately 3,500 in total. 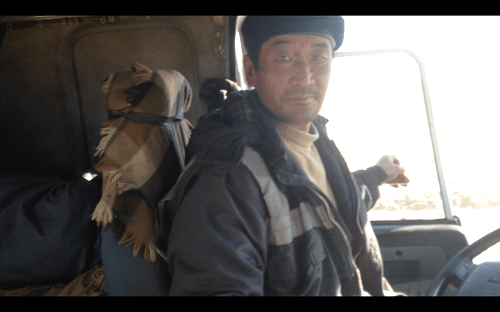 The truck driver, Batbayar, from Khovsgol, who delivers Tavan Tolgoi coal to China. Photo by Bum-ochir Dulam. 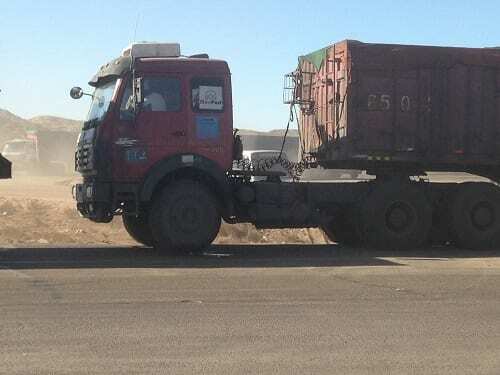 It takes about one week to do the circular route in full (collecting the coal from the mine in Mongolia and bringing it to China to the buyer), but sometimes it can take three days, when two trips by one driver can be made in one week. Each truck is 40 tons, the cargo is 60 tons and together they weigh 100 tons. 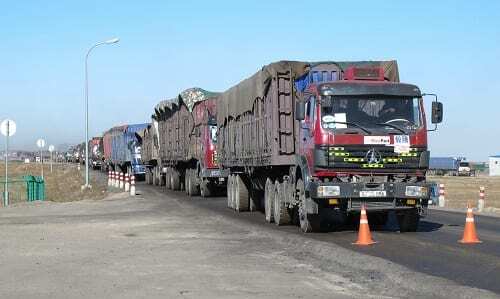 The trucks are weighed on the Chinese side to assess how much coal is being bought. 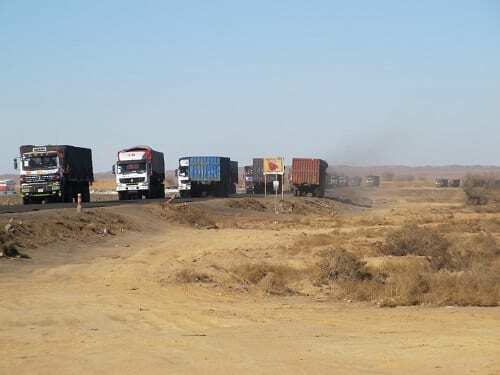 Coal trucks waiting for the border point at Gashuun Sukhait to open. Photo by Munkh-erdene Gantulga. The majority of drivers do not own the trucks which they drive (there is a minority that do own their truck or are leasing to own, and they are usually not hauling Erdenes TT coal). 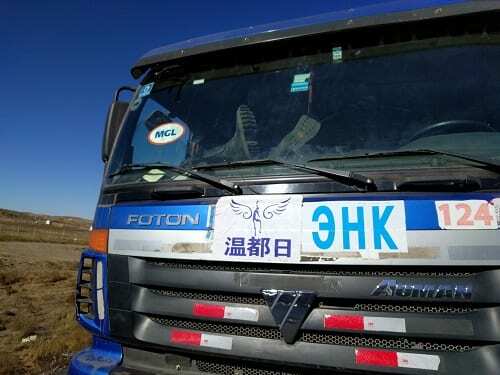 It is mostly Chinese companies who own the trucks which have Mongolian number plates, and stickers adorn the front of cabin with the Chinese companies they are collecting coal for. Previously Chinese drivers were employed but the cost of employing them to work in Mongolia has proved prohibitive for the Chinese companies. While waiting on the long line between Tsagaan Khad and Gashuun Sukhait, a driver gets some sleep with his feet up on the dashboard. Photo by Rebekah Plueckhahn. Most of the trucks have Mongolian drivers (we met one driver who worked for a Mongolian company, and there are also a few Chinese drivers). 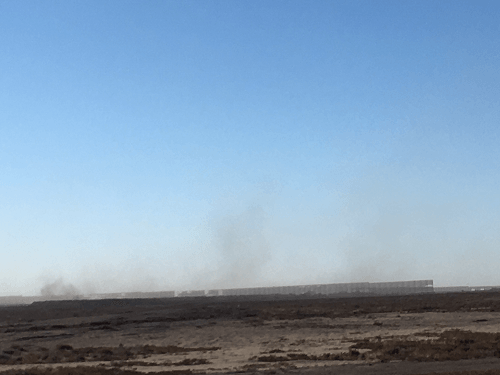 The coal is mostly being taken from Tavan Tolgoi, whereas the cooking coal from Energy Resources is mostly being stock piled along the side of the road, waiting to be sold when the market improves. Coal stockpiles guarded by wind and dust fence. Photo by Rebecca Empson. Batbayar receives 300,000 tgs per month and 250,000 per delivery, which is paid to him in Yuan on the Chinese side of the border once he has delivered the coal to the hanger where it is stored before the Chinese company takes it (probably by rail) to their factory. He goes home every 42 days, but some drivers go home every three months, usually for two weeks. At the Mongolian side of the border are several money changers (changud) who buy the truck drivers Yuan for Mongolian tögrög, although some prefer to wire the money straight to their families from one of three banks at the border (Khan, Golomt, Töriin Bank), located next to a small shop. Sign on money changer’s car reading, ‘Buying Yuan’ (Yuan Avna). Photo by Rebecca Empson. Alongside the coal trucks lined up bumper to bumper for miles (at most 50 kms or more long, with up to 2,000 trucks in the line) are a few interspersed private vans containing small items (like junk metal parts) to sell in China in return for contraband rice (Mongolians are only allowed to bring in 25kg of rice per person from China). Long line of trucks. Photo by Bum-ochir Dulam. Life as a coal truck driver, especially in winter is very hard. Each man sleeps and eats and cooks in his truck cabin for up to three months. Cold, hot and dusty, life in the cabin is lonely and precarious. A truck driver is on a continuous journey which never stops. Always located at some point in the mobile cycle, he is, in one sense, the modern day nomad. Batbayar’s bed in the back of his truck compartment. Photo by Rebecca Empson. 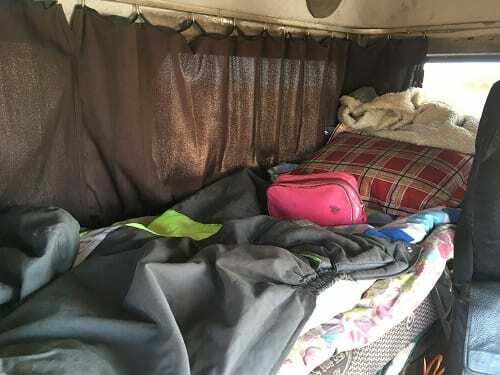 Sometimes there are camps along the road and, of course, there are hotels along the route, but all drivers prefer to stay in their cabins continuously holding their place in the cycle so that they can move along the chain and make money. Without your family and friends, relations have to be made along the way. Truck driver friends along the road. Photo by Rebecca Empson. 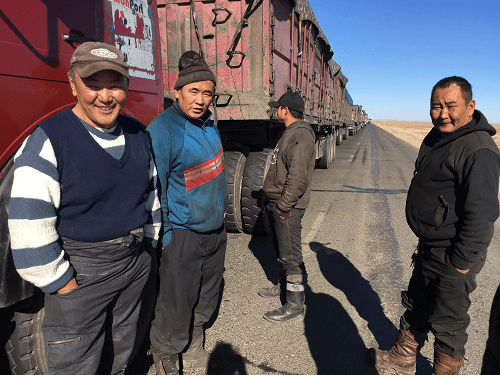 The road is narrow and dusty and the trucks heavy so accidents are common but Batbayar says drivers tend to help each other. 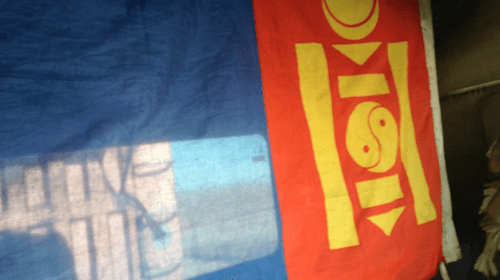 To separate his bed from his driving cabin he hangs a Mongolian flag. A symbol perhaps of the national pride he attributes to his work. Mongolian flag inside truck. Photo by Bum-ochir Dulam. When talking with the changud at Gashuun Sukhait, they said that while the rest of Mongolia is experiencing an economic crisis, here along this coal road, Mongolia is like Korea, a reference to the opportunism offered to young Mongolian men who work in Korea and make cash. With yuan money-changer. Photo by Rebecca Empson. Our project gives special thanks to Nomadic Expeditions for providing drivers and transport for this research trip.